Summer in Pittsburgh offers plenty of flow with which to go. That’s a lot of words but it covers a lot to see and do, from paintings to pedaling and paddling to extreme pogo. In fact the list mainly consists of things available in early summer, from June to mid-July (although some continue beyond then). Look for a Late Summer Short List later! Dollar Bank Three Rivers Arts Festival — June 1-10, multiple times and venues, Downtown. 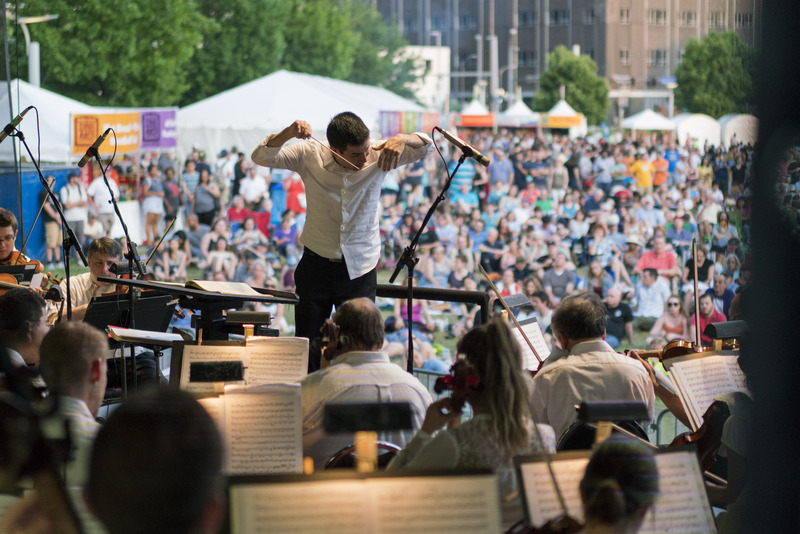 Pittsburgh Symphony Orchestra cranks it up at the Dollar Bank Three Rivers Arts Festival. The 10-day Dollar Bank Three Rivers Arts Festival is Pittsburgh’s largest summer event. Launched in 1960, it has evolved along with the city itself. Early Festivals were focused on the juried visual art show, with hundreds of paintings and other works displayed in open-sided pavilions that turned the plazas near the Point into a temporary outdoor museum. Today you can see a variety of modern visual arts throughout the center-city Cultural District—including an indoor juried Festival show, plus exhibits at five Pittsburgh Cultural Trust galleries and the August Wilson Center. Meanwhile other Festival activities have grown into huge draws of their own. Handmade arts, crafts, and wearables are on sale in 250 booths at the sprawling Artist Market. And this year’s Festival has nearly 70 performing arts acts, all free, highlighted by the nightly Main Stage concerts at Point State Park. Headliners this year include R&B singer Mavis Staples, British indie rockers Everything Everything, Lukas Nelson (Willie Nelson’s son) and his band Promise of the Real, neo-country maestros The Mavericks … and, strange but oh-so-true: the Mendelssohn Choir of Pittsburgh performing The Music of Bob Dylan. All that plus face painting adds up to a can’t-miss! Multiple times and venues Downtown, June 1-10. Allegheny County Free Concerts— June 1 – all summer, South Park and Hartwood Acres. Crowds don’t lie. When people with lawn chairs start arriving in bright daylight to get prime spots for evening outdoor concerts, it’s because the music is good—and free. Allegheny County sponsors weekly concerts all summer in two locations: 7:30 p.m. on Fridays at South Park Amphitheater, and 7:30 p.m. Sundays at Hartwood Acres Amphitheater. Performers are a mix of Pittsburgh-based and touring talent across a wide range of genres. The lineup at South Park in early-to-midsummer includes shows by Pittsburgh Opera, The Tamburitzans (international folk music and dance), pop balladeer Chris Jamison, and rockers Jim Donovan & Sun King Warriors. At Hartwood Acres in June and July, featured acts include the River City Brass Band, singer/songwriter Lera Lynn (see video above), funk artists The Original Lakeside—and, on Father’s Day, an afternoon vintage “Car Cruise” followed by an evening concert with swing band Swingtet 8, joined by oldies practitioner Johhny Angel and jazz vocalist Mary Ann Mangini. 3700 Farmshow Dr., South Park Twp., and 4070 Middle Rd., Allison Park. 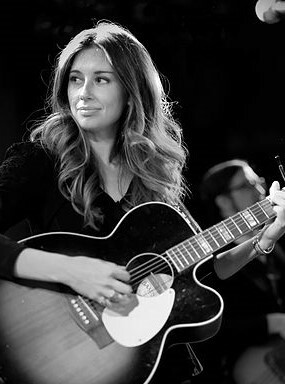 Lera Lynn performing at The Troubadour in Los Angeles in 2015. Photo: Justin Higuchi and Wikipedia. 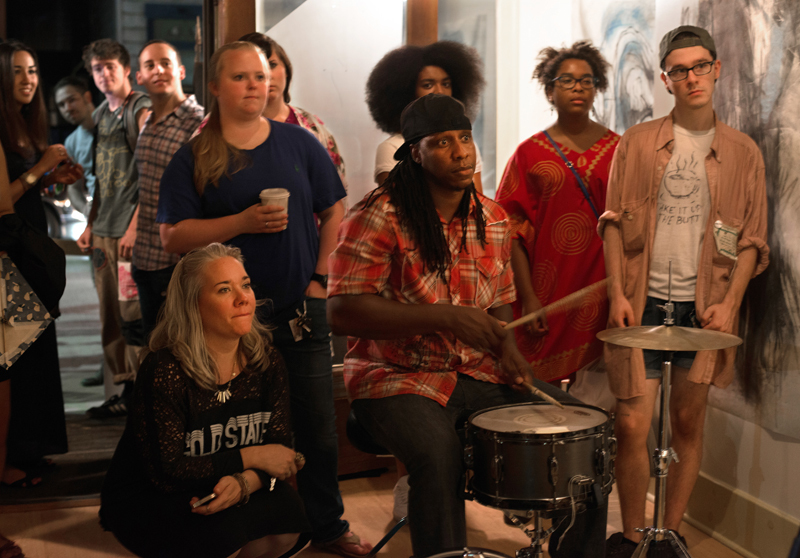 Unblurred: First Fridays on Penn — monthly gallery crawl and street fair. Persons wishing to experience Pittsburgh’s summertime pleasures in the relative cool of the evening will do well to take part in the monthly Unblurred events along Penn Avenue in Garfield. They’re on the first Friday of each month, which, early this summer, means June 1 and July 6. And what’s up is quite a lot. Art galleries along the street are open—the Silver Eye Center for Photography, Level Up Studios, and several more—as are other shops, eateries, and so forth. Many have music or performances. The Garfield Night Market, with stalls and vendors selling a wide spectrum of interesting goods, operates in summer. Above all, Unblurred is a fine occasion to simply hang out, mill about, and enjoy. 6 p.m. till later at night, 4800 through 5500 blocks of Penn Ave., Garfield. Bach, Beethoven, and Brunch— Sunday morning idylls, starting June 18. Sunday mornings in summer mean church to some Pittsburghers, sleep-ins to others … and to many who address such needs without impinging on late morning, Sundays mean Bach, Beethoven, and Brunch. This popular outdoor pleasantry is sponsored by WQED-FM. Fans congregate at the East End’s lovely Mellon Park, bringing brunch or buying bagels from the vendor in attendance. Musicians play classical airs, which may have been composed by artists other than Bach or Beethoven, but are gladly received nonetheless. The performers vary from week to week. Shadyside Brass begins the season June 17, followed by Klezlectic, and then onward into August. 10:30 a.m. to noon each Sunday. Mellon Park, 1047 Shady Ave., where Point Breeze meets Squirrel Hill. Fourth of July Fireworks + More — all day July 4, multiple locations. Everybody knows Pittsburgh has a BIG fireworks display at the Point on the night of July 4. We’re here to tell you about some options and extras. You can start the Fourth in a mellower mood at The Frick Pittsburgh, where the grounds are open from 10 a.m. to 5 p.m. with an outdoor grill and free live music. Plus, you’re welcome to tour The Frick’s indoor attractions such as the Art Museum and the Car and Carriage Museum. (7227 Reynolds St., Point Breeze) Or head to the Point early, where the EQT Celebrate America festival kicks off at noon with a day-long slate of music, kids’ activities, a flyover by U.S. Air Force jets and more, leading up to the EQT Flashes of Freedom Fireworks. 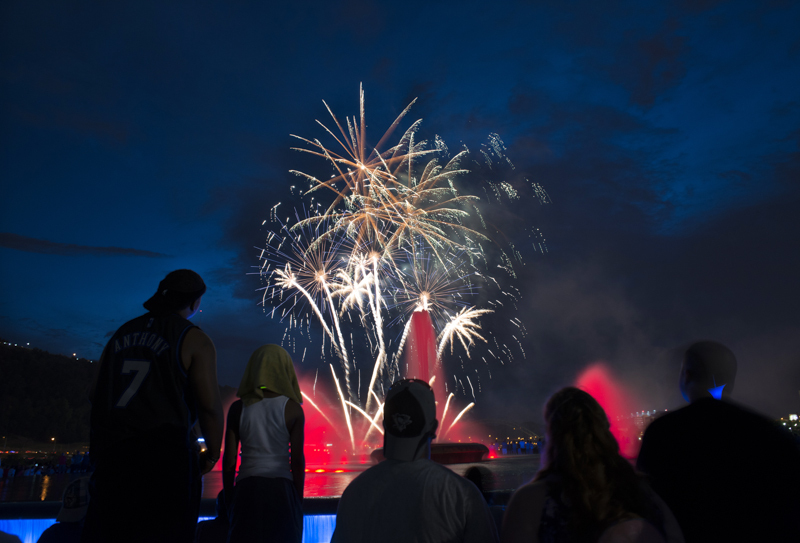 For fireworks with fewer crowds, try one of the many community events around the area, like Mt. Lebanon Community Day. (Mt. Lebanon Main Park, 900 Cedar Blvd.) Or visit the Grand View Golf Club, where—for a modest entrance fee—folks start gathering in early eve to enjoy a spectacular hilltop view of the Kennywood fireworks across the river and dozens more displays all around the horizon. (1000 Club House Dr., North Braddock). Venture Outdoors— Nonprofit with activities all summer (and year-round). 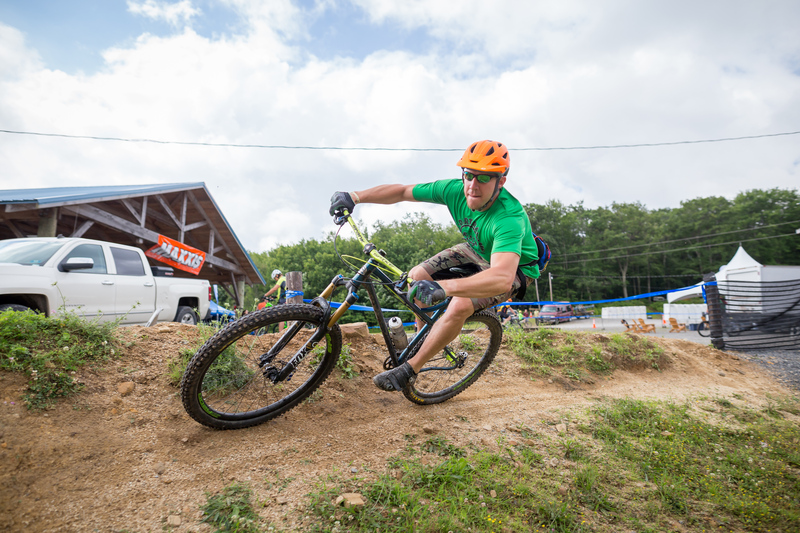 Venture Outdoors is Pittsburgh-based but some events venture far afield. Venture Outdoors? That’s the outfit that runs the kayak rental on the North Shore, right? Well, yes—but this unique Pittsburgh nonprofit offers a great deal more. Every week, Venture Outdoors staff and volunteers lead an amazing array of outdoor activities for the public, on water and dry land. Bicycling events range from long rides to gentle outings for beginners. The schedule includes rock climbing occasionally, and fishing frequently. If walking is your speed, the selection is vast: Venture Outdoors has nature hikes, urban neighborhood hikes, Qigong Walks, and even a Banjo Night Walk. (By now you’ve missed the Cheese Tasting Hike in May but another may come along eventually.) The group also conducts a variety of excursions and learning sessions in kayaking, paddleboarding, etc. 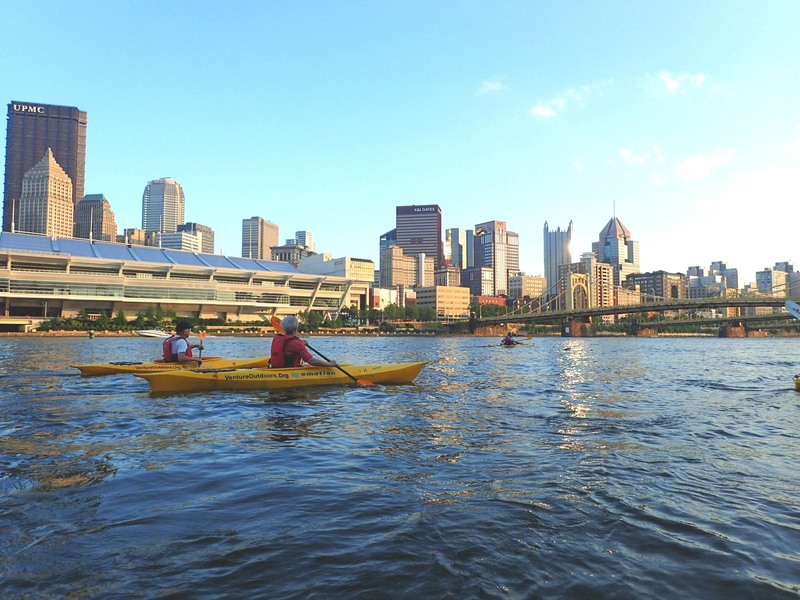 June is a month loaded with events throughout the Pittsburgh area, so it’s a great time to get acquainted with Venture Outdoors. Check the website and we’ll see you somewhere under the sky. 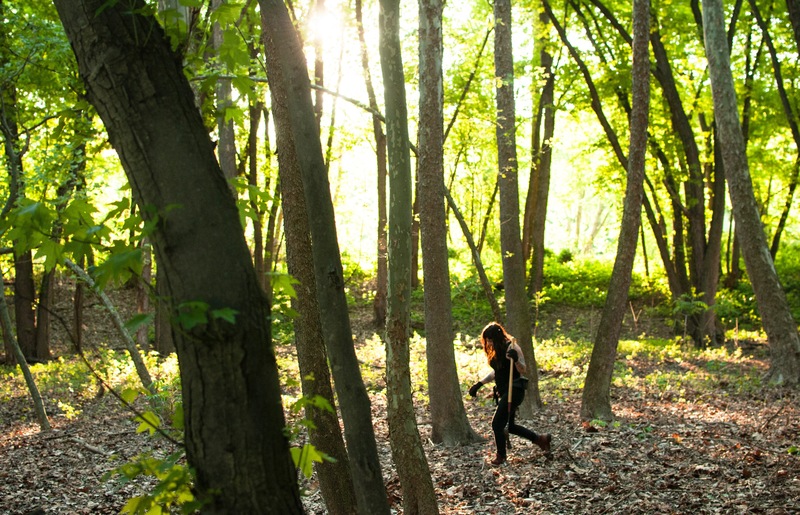 Speaking of Pittsburgh’s best-kept secrets: Have you heard of Allegheny Land Trust? The nonprofit maintains “Green Spaces” across the city and into the suburbs and exurbs. There’s a bunch of them, open daily for activities ranging from relaxed walks to biking, birding, and even camping. Wingfield Pines, south of Downtown, is a reclaimed strip-mining area. Audubon Greenway in Sewickley is notably bike-able. Emerald View Park on the slopes of Mt. Washington offers wooded trails with, as the name implies, great views. And Sycamore Island—in the Allegheny River, just a few miles upstream from the Point—is singularly cool. Reachable only by boat, it’s a patch of undisturbed nature where one can camp overnight (get a permit in advance) almost within shouting distance of the city limits. But don’t shout; check it out. The Land Trust has 19 Green Spaces overall. North Park Swimming Pool and Trails — from June 3 (for the pool) and trails any time. The Pittsburgh area has many beautiful public parks. Let’s zoom in on a couple of great features at just one. North Park is the largest in the Allegheny County park system, and so popular that some parts get quite crowded on weekends. Yet it has under-appreciated assets—notably the North Park Swimming Pool. Opened in 1937, this is one of the largest public pools anywhere, 50 meters wide and 105 long. And it’s not a wave pool, so you can swim 50-meter laps crosswise, bring children to make their own waves (how creative!) in the shallow end, and bask in the gorgeous traditional setting. Also somewhat out of sight, except to those in the know, is the network of multi-use trails in North Park. Over 40 miles of trails wind through the hills and woods, very suitable for biking, running, or hiking. They include a Braille Trail with special markings added. Consult the online maps at Trail Pittsburgh… or just park someplace in the park and find a trailhead. Pool is open 11:30 a.m. – 7:30 p.m. daily from June 3, weather permitting; trails are always open. North Park’s main entry is 303 Pearce Mill Rd, Allison Park. Dirt Rag Dirt Fest: The dirt starts here. 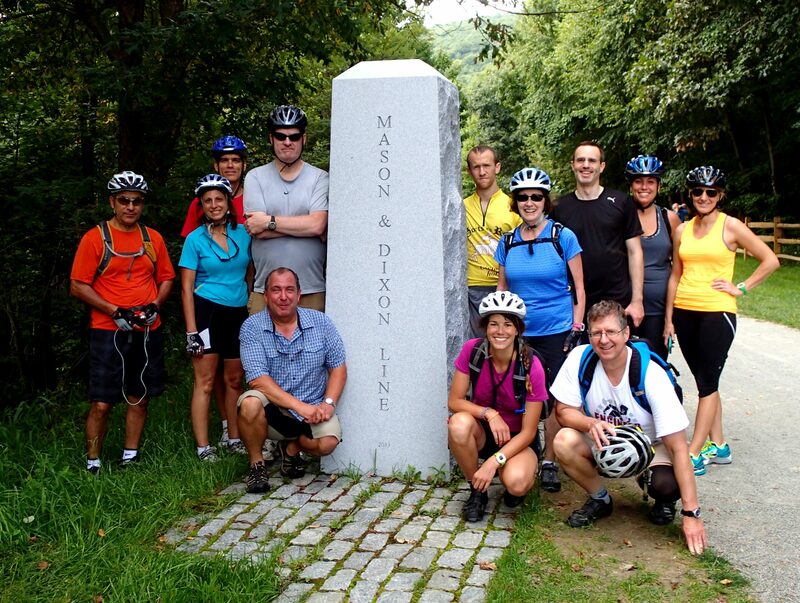 The hilly terrain of Pittsburgh and surrounding areas is ideal for mountain biking. We are home to a premier publication in the field of off-road pedaling, Dirt Rag magazine. And this eminent scholarly journal is hosting a camp-out weekend called the Dirt Rag Dirt Fest. The event is notable in that it has no formal races. Rather, there are participatory group rides geared to all levels of skill and fitness, from easy casual jaunts to the ominously named Ride of Attrition. Other Dirt Fest activities include yoga, for centering oneself, first aid instruction, in case the center does not hold, music, waffles and beer (not necessarily at the same time), and gear (both new and swapped). Unicycles are available for those who wish to learn one-wheel riding and fat bikes are brought by many. July 13-15. Big Bear Lake Trail Center, 450 Big Bear Lake Rd., Bruceton Mills, West Virginia. 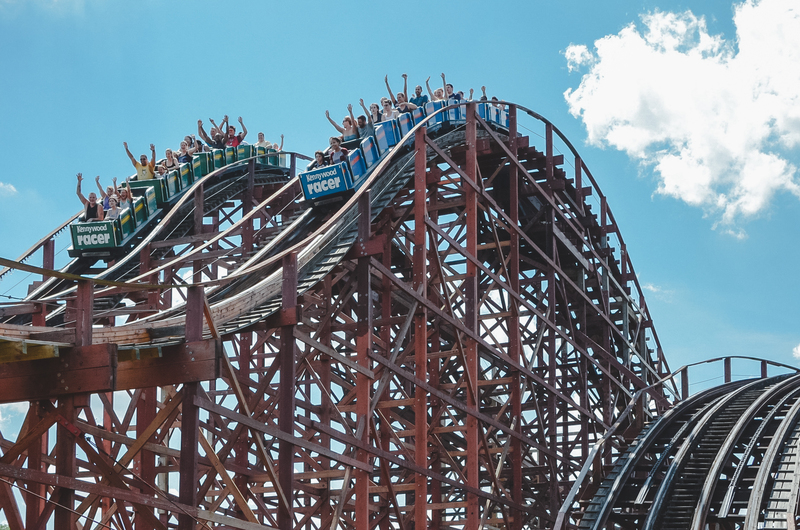 Kennywood and Idlewild — TWO iconic amusement parks. Some “big-league” cities trumpet the fact that they’ve got a big-league amusement park. The Pittsburgh area can claim two: Kennywood Park, close to the city, and Idlewild a bit farther out. Kennywood dates from 1898. It’s known for a world-class collection of mechanized rides, including the roller coasters—three classic wooden coasters plus the steel-frame Phantom’s Revenge—and a growing assortment of kiddie rides. Kennywood also hosts special days such as Italian Day, July 8, with a parade and fireworks. (4800 Kennywood Blvd., West Mifflin) Idlewild offers a distinctive combination of amusements. The rides aren’t as plentiful as Kennywood’s, but there are plenty. Idlewild moreover has a full-scale water park, the Soak Zone, with water slides and a wave pool; an outdoor jungle-gym area; and the weirdly charming Storybook Forest, where children and trippy adults can wander through mini-replicas of scenes from fairy tales and folk songs: You may even meet Little Red Riding Hood’s grandma. And the pirate ship’s crew gives out lollipops. (2574 U.S. 30, Ligonier) Kennywood is open daily from now through August 21, and then on a more limited basis. Idewild and Soak Zone will be open through Memorial Day and then open daily beginning June 1 through August 19. After the 19th on a more limited schedule. Carrie Furnaces — former industrial site, open for tours. At Carrie Furnaces, modern urban art mingles with majestic remains of industrial history. Archaeologists are excited to find well-preserved ruins of former times. Pittsburgh has such a treasure in plain view. 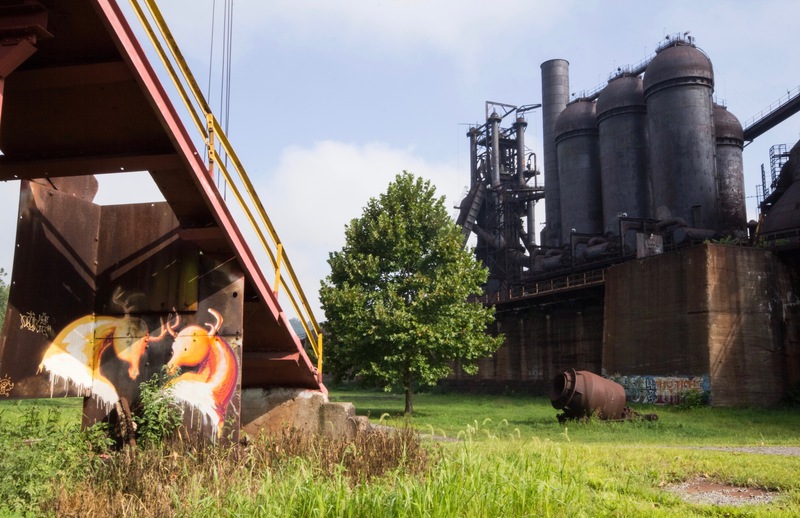 The Carrie Furnaces site—twin blast furnaces towering above the Monongahela River, with auxiliary structures close by—is rare on a global scale, and astounding to visit. Not many old industrial facilities stay intact when they close. These immense furnaces, which boiled iron ore down to molten iron for U.S. Steel’s Homestead Works for nearly a century, were judged too much trouble to demolish after shutting in 1978. And the sheer size of all that is left testifies to the brute-force nature of Pittsburgh’s historic industry. Just random details, such as massive heat pipes held together by bolts as big as human heads, can trigger awestruck imaginings of what it was like to build the furnaces—and to work there. The Carrie Furnaces site is open May through October under management of the Rivers of Steel National Heritage Area. Various kinds of guided tours are available, including (new this year) a riverboat tour. Get info and make reservations at the web link above. Carrie Furnace Boulevard, Rankin. Anthrocon 2018—major international Furry convention. July 5-8, David L. Lawrence Convention Center. Birds of all feathers have returned to their summer habitats, but the annual migrations are not complete until the Furries return to Pittsburgh. They’re coming from points far and near for Anthrocon, one of the world’s foremost Furry conventions. Furthermore: You may be a Furry fan without knowing it. To quote from the Anthrocon website, the convention is “open to any and all who like to imagine what it would be like if animals could walk and talk as we do—and no, you do not have to wear a costume.” Many do, of course. You’ll see tigers and vixens perambulating the streets of Downtown. You can marvel at entire ecosystems of animals marching in the Saturday afternoon Fursuit Parade outside the David L. Lawrence Convention Center. And you’re welcome to join them inside, via registrations for a single day or the whole thing. Attractions include the Anthrocon Tonight talent show, art exhibits, merchandise sales, guest speakers, and more. FYI: Wild as they may seem, Anthrocon attendees are a well-regulated militia. Strict measures are enforced to suppress animals behaving badly. 1000 Ft. Duquesne Blvd., Downtown. Pogopalooza— world championships of extreme pogo. July 21-22, Community Forge in Wilkinsburg. Pogo is an extreme sport. How extreme it is hits home when you watch young athletes soaring ‘way up and somersaulting on high-tech pogo sticks, rebounding off stairs and slanted surfaces, and generally wreaking controlled airborne havoc. Once again this year Pittsburgh hosts Pogopalooza, the world championships of pogo. The “once again” occurs because Xpogo, a company dedicated to producing extreme pogo events and promoting the sport, is headquartered here. The video above is from Pogopalooza 2016, held at the Carrie Furnaces site in Rankin. This year’s Pogopalooza is on the grounds of the new Xpogo offices in Wilkinsburg. The company has teamed with a host of volunteer activists and nonprofits to renovate Wilkinsburg’s former Johnston Elementary School, converting the historic structure to a resource housing community groups, businesses, and special events. The place is now called Community Forge, and extreme pogo (along with music and refreshments) happens there July 21-22. 1256 Franklin Ave., Wilkinsburg. Photo credits: Unless otherwise noted, photos are provided by organizations in charge of the places and activities shown. The lead photo of kayaks on the river is from Venture Outdoors. Mike Vargo, a Pittsburgh-based freelance writer, covers a fair amount of turf for Entertainment Central.